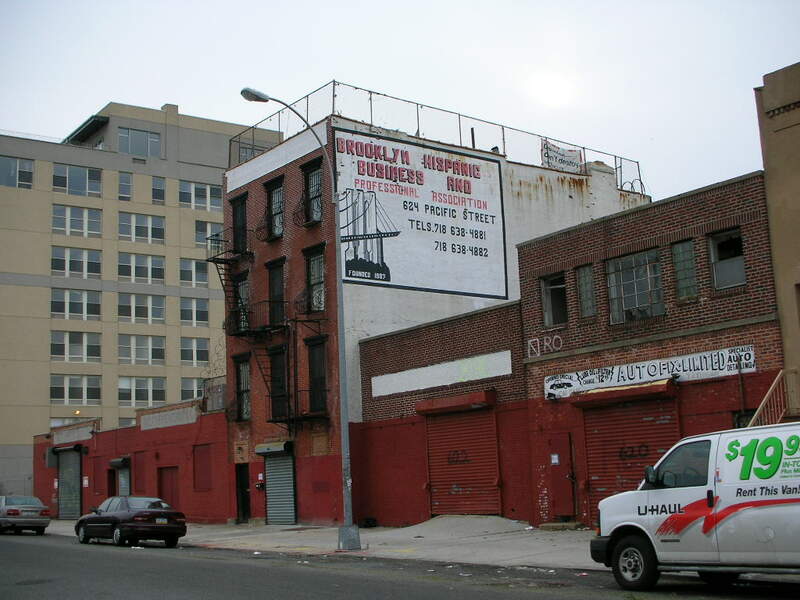 Forest City Ratner's promises of safe practices at the Atlantic Yards site have suffered a setback. 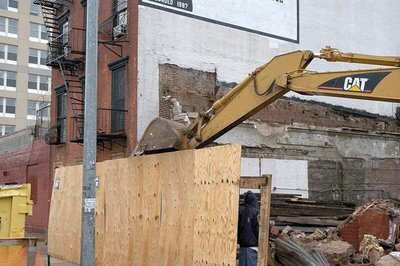 A contractor working for FCR has been assessed two $2000 fines for unsafe demolition of two Pacific Street buildings last June, as an administrative law judge (ALJ) has agreed that a backhoe, rather than hand demolition as promised, was deployed to demolish a wall adjacent to a residential structure. For the demolition of 620 Pacific Street and 622 Pacific Street, the contractor had not applied for a mechanical demolition permit,which would not have been issued for 622 Pacific. 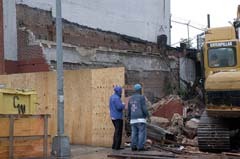 At a hard-fought hearing on 3/12/07, a lawyer representing Forest City Ratner acknowledged that the backhoe was used on 620 Pacific, which was adjacent to unoccupied buildings, but said there was no proof the backhoe was used to demolish 622 Pacific, adjacent to the occupied apartment building at 624 Pacific. That lawyer, Jeffrey Braun, elicited testimony from a representative of Solomon Oliver Mechanical Contracting, who claimed that 622 Pacific was demolished only by hand. However, David Gochfeld, whose fiancee lives in 624 Pacific, took pictures that clearly showed the backhoe being used to demolish 620 Pacific and strongly indicated similar activity at 622 Pacific (photo right and above). A Department of Buildings inspector testified that the evidence backed up that claim, and Gochfeld offered eyewitness testimony. Administrative Law Judge Helaine Balsam of the Environmental Control Board (ECB), the administrative tribunal that oversees violations issued by city agencies, apparently agreed with the latter arguments. According to notices posted on the ECB web site, she assessed $2000 fines for 620 Pacific, as expected, and also for 622 Pacific, the subject of the hearing. As I reported, attorney Braun pressed hard in the hearing, and had it been a criminal case, he might have planted reasonable doubt. But there's a lesser standard of proof in such administrative cases, "preponderance of the relevant evidence." The text of Balsam's ruling was not available yesterday; it should be made available in about two weeks, I was told by the ECB. Will Forest City Ratner appeal? I asked Braun that question yesterday via email, but didn't get a reply. The judge's decision has a symbolic value beyond the total of the fines. In sending a leading land use lawyer to defend the contractor, Forest City Ratner undoubtedly spent more money on legal fees than the fines at issue. In most cases, defendants choose to cut their losses. However, given the contested nature of Atlantic Yards--and, this was before the fall of the Ward Bakery's parapet in April--the developer apparently wanted to avoid the taint of a violation. Also, Gochfeld's fiancee and other tenants at 624 Pacific and another Forest City Ratner-owned building have filed suit challenging the state's use of eminent domain in "friendly condemnations," arguing that a slower state process regarding rent-stabilized tenants should prevail. Their suit was dismissed earlier this month; they will appeal. The 13 plaintiffs are also challenging the state's relocation offer, calling it inadequate. 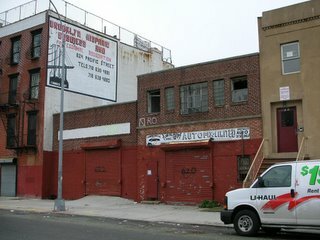 Meanwhile, Forest City Ratner is in the process of demolishing the building on the other side of 624 Pacific.